Exotic spices are much sharper than the herbs from our garden. Don’t we have any spicy seasonings? White vitamin C-rich taproot of horseradish (Armoracia rusticana, or Cochlearia armoracia, from the cabbage family or Brassicaceae) is related to the sharper Japanese variant Wasabia japonica, which is used in sushi, called wasabi. Grating or bruising releases allyl isothiocyanate, a fairly volatile compound, which has a sharp flavor similar to mustard or radish. It is released by contusion from the cell structure of the root by an enzyme. The taste then runs back. Adding vinegar (acid) stabilizes this otherwise evaporating taste. The black radish (Raphanus sativus subsp. Niger) differs from the radish (Raphanus sativus subsp. Sativus) in that the latter is a stem tuber and black radish for the most part is a tuber. This makes the black radish has a milder flavor, is stronger and bigger than the sharper, peppery-tasting radish. As poor substitute to pepper we may use dried seeds from nasturtium (Tropaeolum majus). The beautiful, twining plant is all edible and healthy: leaves, flowers and buds, seeds .. The nasturtiums received their common name because they produce an oil that is similar to that of watercress (Nasturtium officinale). Tadeonal is the substance responsible for the sharp taste in water pepper or marshpepper knotweed (Polygonum hydropiper and Persicaria -). The somewhat bitter cress is growing in clean water. Juniper provides a fresh bitter and spicy flavor. The dried fruit cone (sham berrie) is used as a spice in marinades for game and sauerkraut. Fennel seed has a subtle anise flavor. The garlic family (Alliaceae) has nearly 700 species worldwide. They are perennial bulbous plants and pleasant seasonings ranging from mild to spicy. They usually have a papery outer skin over a layered core: garlic (Allium), chives (Allium schoenoprasum), wild garlic (Allium ursinum), garlic (Allium sativum), leek (Allium porrum), shallots (Allium ascalonicum). Onions (and related) are pretty sweet, but also have a strong taste and smell, which decreases when heated. General yellow onion tastes common and sweet, the white tart and sharp and red milder. When cutting onions sulfuric acid compounds are formed. The enzyme alliinase reacts with sulfur compounds to the gas propaanthial-S-oxide, which irritates the nerve endings in the eye. 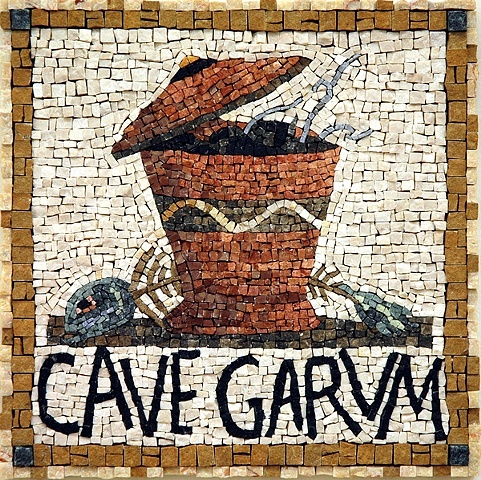 Two thousand years ago the Romans even had their sharp seasoning: fish sauce Garum. Whole fish, or only the viscera are mixed with 15 to 20% of their weight in saline. Which stays three to five days in the sun (or yogurt maker at 40⁰C) fermenting and stirred once or twice a day. The fermentation last even several months. The sieved or leaked moisture is Liquamen. You can add old wine or herbs. The best garum (according to the Geoponica called 'haimatum’) shall be made with only the intestines, blood and gills of tuna fermented to garum with salt in a pot in two months. Classic strong flavors we make here for generations long are usually acidic: vinegar and mustard, sauerkraut, sour juice (ver jus). A chutney is made by mashing together the spices and seasonings to fruit puree (sauce): tamarind, ginger, mustard, garlic, vinegar, pepper and onion. It also happens that exotic herbs such as fenugreek, coriander and cumin are used. Often chutney tastes too sweet from added sugar, or acid by vinegar. Pickles are strong acid pickled (blanched) vegetables like onions, cauliflower florets, chopped small gherkins, (carrots, celery, herbs, vinegar (and sugar)). To make Tabasco leave crushed hot peppers (Capsicum fretescens e.g. var. Tabasco) with salt (1 in 30) ferment in their own brine at room temperature. The (possibly as with sauerkraut weighted with stone) puree must be sealed from air by the brine. Afterwards you can remove the seeds with a food mill and possibly add some vinegar. And use according to your own inspiration herbs etc.. If you have a lot of patience you can go for the real thing and have it 3 years maturing in oak barrels. For ketchup, there are dozens of recipes with crushed and mixed ingredients that are boiled. Naturally: tomatoes, peppers, vinegar also onion, celery and (not too much) sugar. Supplement to taste it with garlic, mustard seeds, bay leaf, tarragon and salt. And possibly exotics like cloves, star anise, coriander, cayenne pepper, peppercorns .. The word comes from the Chinese ketsiap: salty fish sauce.